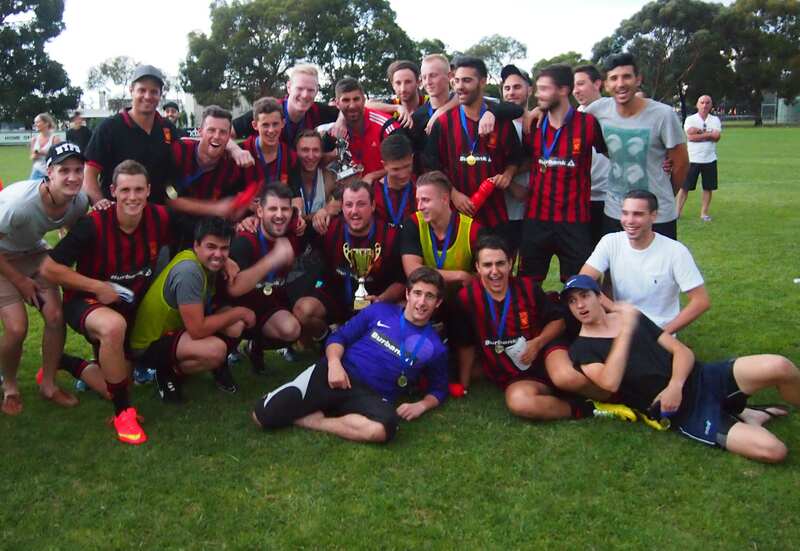 Geelong won the 2015 Diversity Cup after a penalty shoot out against Corio at Hume Reserve on Sunday night. At the end of normal time the teams were locked at one-all and the match committee and the two teams decided to go straight to penalties rather than risk the game finishing in the dark if extra-time were played. It was a sensible decision. Fourteen of the 22 players in action in the Diversity Cup final. Click on pictures to increase their size. The game itself was very even as both teams had good creative moves that resulted in a number of chances at either end, but for the first hour neither could break through. Geelong’s Michael Boyar was clean through but squeezed his shot just wide of the right hand post. At the other end a Corio corner was headed back across goal and Justin Hanns’ header was somehow cleared off the goal line by the Geelong defence. Tackles went flying in and a number of players were booked, and there was what the Scots would call a ‘stramash’ in the middle of the park. That means there was lots of pushing and shoving and posturing, then the players got on with the game. The stalemate was broken by two goals inside 90 seconds. Corio’s Hanns fed a lovely through ball to Andrew Palmieri who rounded the Geelong keeper Sam Versace and put his side ahead. Geelong hit back straight away setting up Jasmin Ikanovic at the other end, who also took on and beat the opposing Corio keeper Alec Kitanovski to equalise. A short downpour took the heat out of a match that threatened to boil over, but the rain made the pitch slippery and difficult for players to keep their feet. Referee Mitko Nikolovski who celebrated 40 years in the game as player and referee, had his work cut out to keep the peace, but did so. 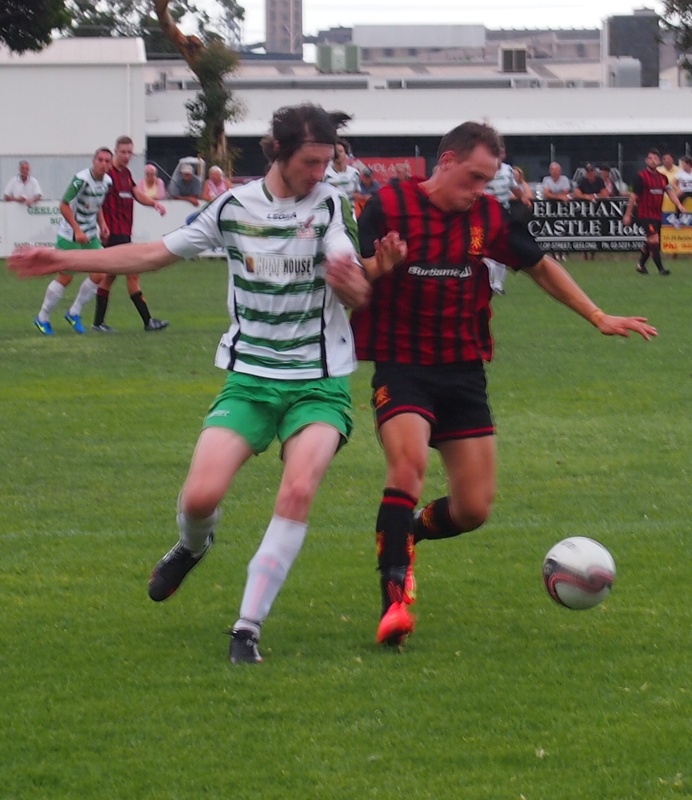 Jimmy Watson of Corio showed some lovely skills out on the left skinning two defenders but his cross was just too high for the leaping Paul McGlounan who had the goal at his mercy. 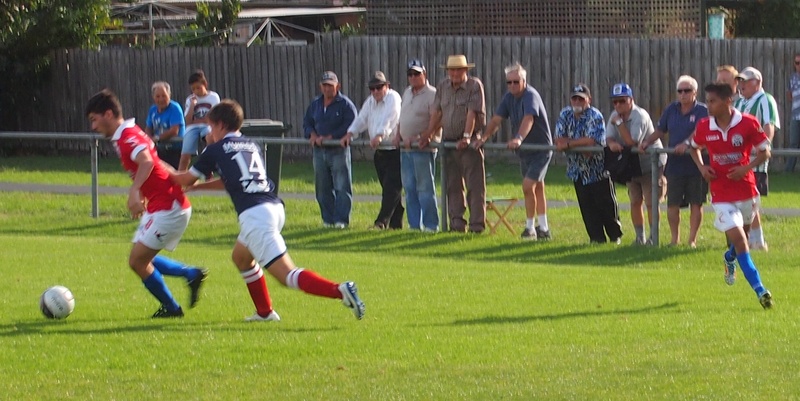 At the other end Alen Paleka got on the end of quick Geelong riposte but lifted his shot over the bar. So it went to penalties. 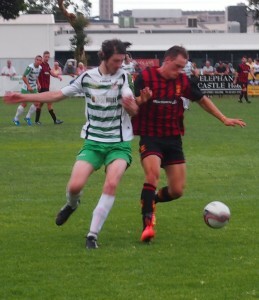 Louis Bentley of Geelong had his shot saved by Kitanovski after Palmieri converted for Corio. McGlounan and Steve Vangelovski scored, then Jordan Nelson of Corio had his effort saved and Michael Boyar from Geelong leveled the scores once again. 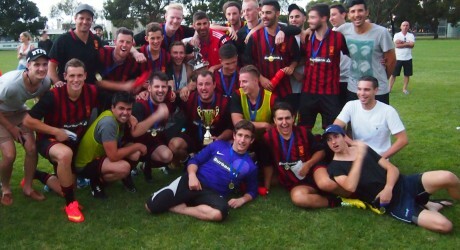 Next up were Steve Luczo of Corio and Ikanovic of Geelong and both scored, but when Jayden Kinces of Corio missed it was left to Tom Langman of Geelong to convert the winning penalty. 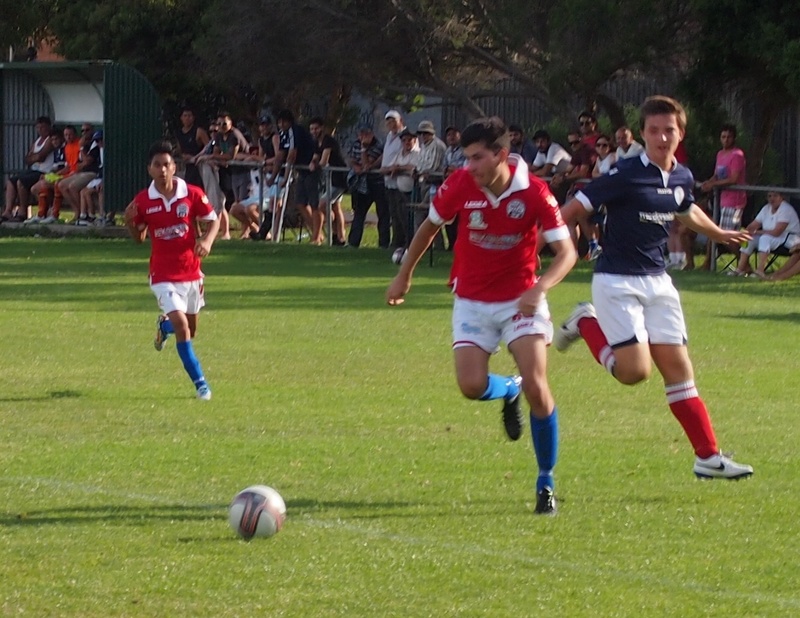 In the match for third place Geelong Rangers were just to strong for North Geelong Youth, running out winners by seven goals to three. It was four–nil to the dark blues at the interval with goals to Lars Halse, Mathias Gorisito, Ryan Calder and an own goal. 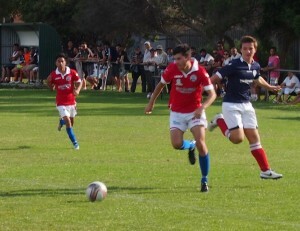 Action from the Geelong Rangers versus North Geelong match for third place. The teams got three goals each in the second half, with Rangers’ ones coming from Evan Black, Panagiotis Vasileiou and Matthew Long. 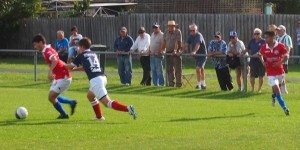 For the tired and plucky North youngsters, Frank Modica, Max Muscat and Matt Humphries got the goals. It must have been a long time since a match produced ten goals with ten individual scorers.